1. An integrated approaches validates the topic i.e. The student believes that this topic is important as multiple teachers are talking about it. 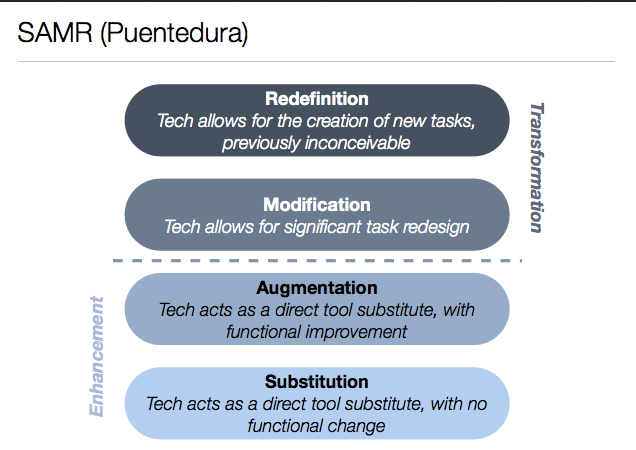 The SAMR model was designed by Dr. Ruben Puentedura and allows teachers to evaluate how technology enhances or transforms the learning experience. Is it substitution of a practice already occurring WITHOUT technology? Does it augment the practice with additional features? Does it modify the task in different and exciting ways? Or does this technology completely redefine the task? How is the SAMR model useful for technology integration? While researching mobile technology and pedagogy for my graduate course, I discovered that the SAMR model was a perfect complement and expression of my current integrated approach to the curriculum with technology. Before learning about it, my simple goal was to ONLY integrate technology that enhanced student learning and knowledge. The SAMR model takes this idea one step further by breaking down the manner of that integration in projects or activities. This is an excellent resources for curriculum planning and collaborations with colleagues. In my initial enthusiasm, I boldly declared (thankfully to myself!) that all my student activities with technology should be redefinitions. This is lofty goal will surely be true someday very soon but for now in 2013 a healthy balance of activities in different areas of the model might be best to win over all parties in our environment. 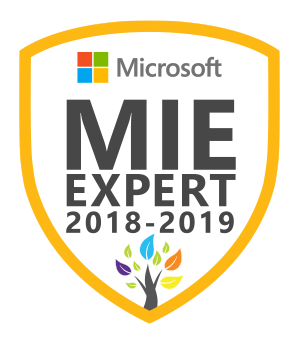 Final note – although this post refers to technology integration into classes, I am lucky to work with other specialist teachers who ALSO believe in an integrated approach. Thankfully, Art, Music, Physical Education and other Languages are spread liberally through the experiences and curriculum of students. AND being nosy I try to find out what all the specialists are doing too for integration opportunities. Perhaps I should wear a t-shirt with Mr. Nosy from the Mr. Men on it! Where does PBL (Project based Learning) fit into the SAMR model? A useful flowchart for Technology Integration – So helpful for teachers evaluating when to use technology in their lessons. Excellent chart on “Using Tech vs. Tech. Integration” – clear and helpful! Jennifer Magiera’s blog post on using SAMR model for iPad integration – useful for us as we integrate iPads in classes! This is a useful overview. Really like Allan’s Pedagogy Wheel. Thanks! It is so great to explore all the recent developments and research on technology integration and learning. Hopefully, I can share my experiences and also learn from the breakthroughs by successful educators all around the world.